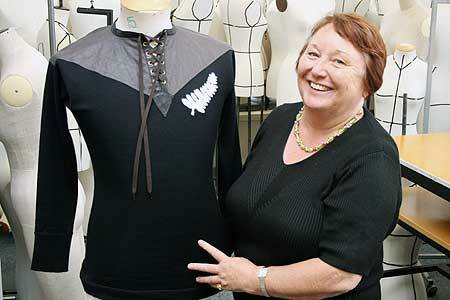 Fashion design tutor Tina Downes has recreated replicas of All Blacks rugby jerseys worn by three of the earliest teams including the “Originals” and “Invincibles” of 1905 and 1924 respectively. The jerseys not only look the same as those worn by the early touring teams, they have been knitted at Manawatu Knitting Mills using the same techniques and materials. The mill was used by the New Zealand Rugby Union to make the 1905 jersey too. Tomorrow the jerseys will be presented to the New Zealand Rugby Museum in Palmerston North. Museum director Stephen Berg says the project is essentially a conservation exercise year, to allow the museum’s only surviving 1905 jersey (one of just six in the world) to be preserved in Rugby World Cup year, when thousands of international visitors are expected. 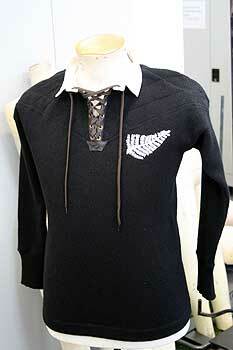 The third replica is of the blue jersey worn by the first New Zealand rugby team in 1884. It has a gold rather than silver fern on the chest. It had to be designed from photographs because none remain and the colours were determined from research. Unlike modern jerseys, which are totally synthetic, all three jerseys are made primarily of lambs’ wool. Ms Downes, who is based in the College of Creative Arts School of Fashion Design in Wellington, says she found it amazing that two Manawatu companies that made the 1905 jersey, Manawatu Knitting Mills and Robert Embroidery of Palmerston North, were still going. “Embroidery is my passion so it’s nice to be able to do some historical work,” says Ms Downes. Challenges included finding materials for adornments like the shoulder yoke to the 1905 jersey, which was a brown linen. Ms Downes suspects it had linseed oil applied to it. “There were other technical challenges also, such as the original jerseys were made with machinery using imperial measurements rather than metric,” she says. Some detective work was involved too. A monogrammed “M” in the museum’s jersey, originally worn by 1905 All Black Jimmy Hunter, was also found in the other surviving jerseys of that team, so has been included in the replicas. Staff from the museum and the knitting mill concluded that the mill had the letter knitted into the jerseys most probably as a brand mark. Because there were no remaining 1884 jerseys and there was no colour photography in that era, it was research that revealed the jersey was made in a rich blue with a gold fern. 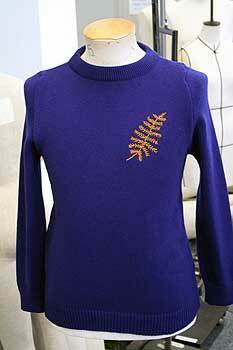 The 1924 jersey was knitted in heavier wool than its predecessors, which has also been matched in the replicas. The museum plans to display the replicas – two of each have been made – and may allow them to be worn by visitors for souvenir photographs. The possibility of reproducing them for sale has been considered but the cost of the materials and the production values would mean a retail price well in excess of the $100-$150 paid for replicas of modern synthetic jerseys.